Department mission: "To develop, conserve and enhance natural resources for present and future Alaskans." The mission of the Division of Geological and Geophysical Surveys (DGGS) (http://www.dggs.alaska.gov/) is to determine the potential of Alaskan land for production of metals, minerals, fuels, and geothermal resources, the locations and supplies of groundwater and construction material, and the potential geologic hazards to buildings, roads, bridges, and other installations and structures (AS 41.08.020). To meet this mission, the DGGS conducts energy research and analysis throughout the state on oil, gas, coal, or geothermal resources, often in partnership with other state, federal, university, tribal, or private entities. DGGS research and publications can be found here. The Division of Oil and Gas (http://www.dog.dnr.alaska.gov/), responsible for the state's oil and gas leasing programs and developing the state’s coalbed methane and geothermal resources, conducts various supportive energy research including geologic, economic, environmental and social analyses. 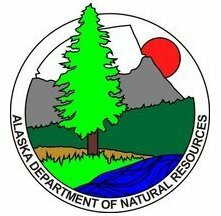 The Division of Mining, Land & Water (http://dnr.alaska.gov/mlw/index.htm) is the primary manager of Alaska's land holdings and mineral and water resources.